Two compartment enclosure for colocation facilities with customers requiring a minimal amount of rack space. 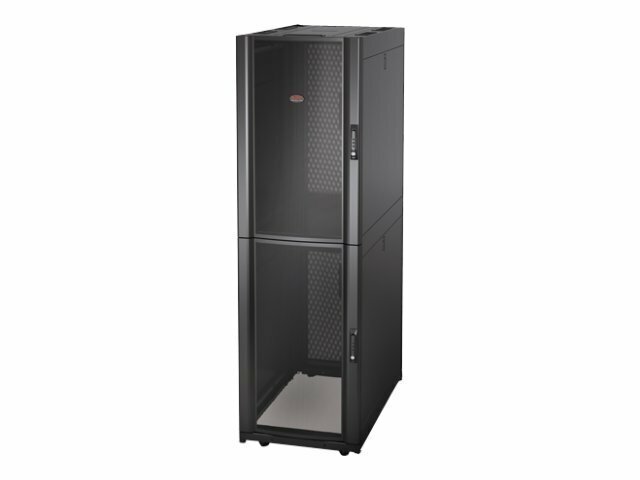 This multi-tenant, security enhanced enclosure is provided with a compact width to optimize data center space. Combination lock handle standard - Top and bottom sections can be locked independently with a customer designated combination. Divided enclosure with two secure rackmount bays - Two customers can share one enclosure, minimizing enclosure footprint and maximizing power and cooling architectures. Security cover for rear accessory channel - Rear channel cover isolates cables passing through the top or bottom bay to prevent access from the other enclosure customer. Top and bottom equipment mounting rails adjust independently - Allows each bay to be configured to meet customer specific applications. Enclosure adjustment tools and hardware provided - All enclosures are provided standard with hardware bag that includes hardware for mounting IT equipment and tools for simple enclosure adjustment. Equipment mounting rails integrate with patch cabling systems - Equipment mounting rails include zero U mounting holes beside the EIA 19" mounting space that allow the installation of Data Distribution Cable (DDC) patch systems without taking up any critical equipment U-space. AV and Networking enclosure designs do not include hole locations for integration of DDC cabling. Other 1U, 2U, and rear enclosure zero U options are available for use with these enclosures. Quick release doors - Front door can be moved to the opposite side or interchanged with rear doors. Doors are easily removed with simple lift-off design. Perforated front door with curved profile - Perforated front and rear doors provide ample ventilation for servers and networking equipment. Front door perforated area is optimized with a curved profile to provide greater surface area and allowance of more perforation coverage and higher perforation rating. Simple Selection - No need to spend hours choosing from and compiling dozens of part numbers to create a single enclosure. 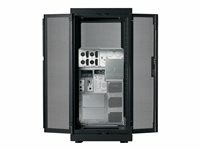 Schneider Electric has made it easy by handling the details and providing complete enclosures with single part numbers. Cable access openings with pre-installed brushes - Large cable access slots in the roof provides access for overhead cable egress. The bottom design allows for unobstructed cable access through a raised floor. Roof includes openings with brush strips pre-installed in locations biased towards the front of the enclosure to allow for data cable passthrough and provisions for air containment. Half-height side panels and option with brush strips for pass-through - Half-height quick release side panels reduce size and weight for easy handling and access to equipment. Side panels are lockable utilizing a single key with the doors. Now available are side panel options integrated with pass-through holes and brush strips for routing cabling to adjacent racks in a row while still maintaining proper airfow. Eyebolt support integrated into enclosure frame - Integrated eyebolt holes at the top of the enclosure frame allow the enclosure to be lifted for movement and enclosure placement using eyebolt lifting mechanisms. Refer to enclosure user documentation for detailed specifications on eyebolt requirements and enclosure weight limits. Easily removable cable access roof - Roof can be removed with simple pull-pin hinges for access during equipment installation or even with cabling already in place and routed through the cable openings. Once removed the roof is reversible to reposition the larger cable openings for power distribution plugs and connectors. Vendor-neutral EIA-310 19in Rack Mounting Compatibility Guaranteed - Vendor-neutral mounting for guaranteed compatibility with all EIA-310 compliant 19" equipment. The "Fits Like a Glove" money back guarantee provides peace of mind that all of your EIA-310-E compliant rack-mount equipment will physically fit in a NetShelter. Optimized for high capacity cable management systems - NetShelter SX enclosures are optimized for use with high capacity cable management systems that attach to equipment mounting rails inside enclosures aligning with equipment mounting u-spaces and provide channels for routing and managing cabling. Schneider Electric Rack Systems Compatible - Compatible with a variety of Schneider Electric rack accessory products to provide the ability to create a complete rack system. Configure rack solutions using industry leading Schneider Electric Design Portal - Small IT Solution Designer configurator complete with verification of product compatibility and useful 3rd party equipment catalog to aid in visualizing your ideal rack solution. Integrated with InfraStruxure products - Schneider Electric cooling, power distribution, and cable management products work seamlessly with IT enclosures to provide a complete infrastructure support system. Integrated electrical grounding - The roof, side panels and front and rear doors are grounded to the frame of the enclosure. Eight additional electrical grounding inserts are located on the frame for external grounding. Designed for enhanced structural stability - A proven frame design, heavy-gauge mounting rails, and heavy-duty casters provide for 3000 lb (1364 kg) static (levelling feet) and 2250 lb (1023 kg) dynamic (castor) load ratings. Enclosures have been tested and approved to be combined with proper bolt down accessories to meet various seismic requirements. Check apc.com for product documentation for specific requirements. Enclosure assemble-to-order (ATO) options capable - The Enclosure ATO (Assemble-to-Order) options provide a level of customization for enclosure customers beyond the standard enclosure models. This customization is limited to the assembly of the enclosure itself and does not include additional enclosure mounted components. For example, the enclosure can be assembled without sides, doors, or without sides and doors. Check apc.com for enclosure size options and availability. Adjustable mounting rails with captive hardware and rapid alignment - The vertical mounting rails can be adjusted in 1/4 in (6.4 mm) increments covering virtually any mounting requirement for IT equipment. Easy alignment feature integrated into the enclosure mounting rail and side brace for quick alignment verification without the use of tools to verify alignment. U positions are numbered front and back for rapid installation of equipment. Pre-installed full-enclosure height rear accessory channels - Integrated and adjustable rear accessory channel provides zero U mounting locations for toolless accessories. Each channel has two mounting bays to support a combination of up to four accessories such as PDUs and vertical cable organizers. 1070mm (42in), 825mm (32 in), and deep enclosures and networking enclosures include two channels. 1200mm (48in) deep enclosures include four channels. Channels are pre-installed at the factory in the rear of the enclosure but can be moved to other locations of the enclosure along the side brace to resituate cable management where it is needed most. Special packaging options for shipping rack with equipment pre-racked - Enclosures with shock packaging are standard enclosures with provisions in the packaging design and enclosure assembly for shipping the enclosures with equipment mounted inside. Extensive industry experience with the leading IT manufacturers and most recently certified with Cisco® for pre-racking and shipping Cisco Unified Computing Systems (UCS). Check apc.com for enclosure size options and availability. Low-profile castors and adjustable leveling feet from underneath or above - Enclosures are shipped standard with both leveling feet and castors. Leveling feet can be quickly adjusted through the use of a screwdriver or drill, eliminating the need to reach underneath with a wrench. Split rear doors - Split rear doors improve access and serviceability to rear of rack mounted equipment. The split rear doors help to maximize floor space. Only 11 inches (279 mm) of clearance is required behind the enclosures to allow for door swing. Integrated joining hardware with multiple width enclosure alignment - Enclosures include pre-installed joining hardware to join enclosures in a row and provide additional stability to the enclosure. The pre-installed joining hardware includes holes for joining to an adjacent enclosure at 600mm centers or 24in centers depending upon the floor layout. All APC Cabinets can be subject to extra delivery charges over and above whatever charge is shown on the product page, especially where next day delivery is required. Where stock is available for next day delivery, a delivery charge of at least £40 is applicable. The service is a standard next day kurbside pallet delivery between 8am and 6pm. This service is a kurbside pallet delivery normally within 7-10 days of order. A courtesy call will be made in advance of the delivery by APC's courier. This service is available for deliveries anywhere in Europe although extra charges will apply dependant on delivery address. This is a full sited delivery service. A site survey will be carried out in advance with a quotation to follow. The delivery includes sitting the rack in its final position and removing all packaging. This service can take 2-3 weeks and pricing can only be quoted after site survey has been completed (For more information on this please call our sales team).